Used X-Ray Equipment For Sale. Refurbished, Pre-Owned & Reconditioned X-Ray Equipment at Reasonable Prices. Used and Refurbished Radiology Equipment and X-Ray Equipment, Used and Refurbished Diagnostic Imaging Equipment, Used Cath Labs, Used C-Arms, Used MRI Systems, Used CT Scanners, Used PET Scanners, Used Nuclear Medicine Equipment, Used Mammography Equipment, Used Fluroscopy Equipment and Used Cardiology Equipment. The future of digital radiography is now AXIOM Aristos FX Plus, the new Siemens digital radiographic solution, providing superb ease-of-use combined with outstanding networking, renowned for high image quality and low levels of radiation dose. AXIOM Aristos FX Plus embodies the revolutionary technological innovations needed to optimize workflow in digital radiography and to overcome the everyday problems faced in today's over-stretched radiography departments. 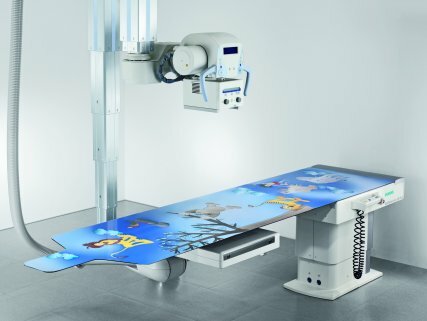 The innovation lies in having two ceiling-mounted components, a highly flexible digital flat detector and our proven x-ray tube, performing virtually all radiography work with a single detector. As an all-rounder, AXIOM Aristos FX Plus also permits acquisitions of standing examinations and even scoliotic spine and long leg examinations*. The final result is an innovative system that delivers a wide spectrum of clinical applications with its intelligent automated system positioning and workflow improvements in digital image acquisition and data management.